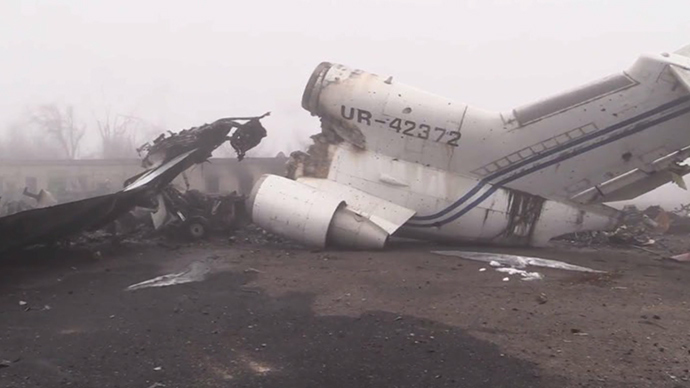 Footage has emerged of Donetsk International Airport resembling an airplane graveyard. Strewn everywhere are torn parts, fuselages split in half and other debris – a remnant of months of fighting between the Kiev government and the Donetsk opposition. The airport witnessed some of the heaviest fighting during the uprising in East Ukraine. When RT visited the scene in October, it witnessed what correspondent Roman Kosarev described as “complete devastation.” The entire infrastructure of the airport had been replaced by a garbage heap of concrete and metal. The scenes tell the story of a brutal standoff for one of the key targets in eastern Ukraine, between forces loyal to the Kiev government and those to the Donetsk People’s Republic (DNR). Several battles over the airport between May and late September took the lives of more than 70 people. The destruction is all over the place; it’s difficult to imagine planes landing here once. In October, a commander with the Donetsk uprising told RT that “for an hour [the Ukrainian army] attacked us with grenade launchers.” This took place when soldiers with the Kiev army took up a position in an airport terminal building, with members of the uprising trying to flush them out, taking heavy fire. The international airport used to handle some 5 million passengers annually. About $500 million was recently spent on a new terminal before it was completely obliterated. The only thing that functioned somewhat was an airstrip, allowing the airlifting of supplies and reinforcements. The reason for the airport’s current condition lies in part in the September 5 ceasefire never having spread to the area. Rebels have accused the army troops holding what remains of the airport of launching daily artillery attacks on Donetsk, causing dozens of post-ceasefire civilian deaths. Since then both Kiev and the rebels have accused each other of violating the September Minsk agreement. However, commanders on both sides met in December and shook hands in the wake of the ceasefire, agreeing that the “fraternal” conflict would come to an end. On December 12, news emerged that a lasting solution may indeed be in sight. “Today, for the first time in seven months, there was a real 24-hour ceasefire,” Ukrainian President Petro Poroshenko said. A new round of peace talks between Kiev and rebel forces is expected in Belarus capital this Sunday.